My New Book Is Ready! 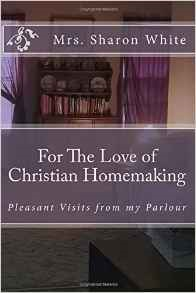 "For The Love of Christian Homemaking: Pleasant Visits from my Parlour "
- Includes a complete index of 160 entries. - Front cover image is from Mrs. White's home. "You won't find cleaning advice or the latest ideas for saving money in this book. What you will find is a collection of over 150 visits from Mrs. White's parlour during her homemaking breaks. Each visit is from her daily life. 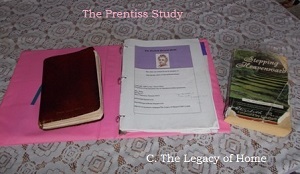 These include remembrances, ideas, essays or short daily journals. There are sad times and happy times; sickness and health; different moods; and dealing with the good and the bad. These are designed to encourage, inspire and motivate you to keep charm and romance alive in a humble home." This is a compilation of posts from the past 3 years, specifically chosen for the Christian homemaker. I would love your help spreading the word.. More books are in the works. Thank you so much for your support, kind comments and continued encouragement! "I finished reading this book last night. It was such a joy to read! What do I have in common with Mrs. White? Almost nothing, and yet, I couldn't get enough of this book, taken from her blog. I wish it had lasted longer as I found myself looking forward to curling up in bed with it every night and continuing the little stories of trials and triumphs and Mrs. White's always positive attitude. I also learned something about myself from reading this book. Mrs. White talks about what a blessing it is to provide a home for her family. It gives her such a sense of accomplishment and peace. She is a married housewife with five kids. I am divorced with no children. She works in the home and I am forced to work outside the home. But anyone with the desire can be a HOMEMAKER. Anyone, married or not, children or not, can make their house a home. A sanctuary, a resting place, a peaceful place, a place where you can serve others. You are only limited by your imagination. If you make your house a home, it can actually become your own mission field." "Her book, For the Love of Christian Homemaking is an extension of the ministry of her blog, but in a format that makes her posts easy to carry around so that one does not have to be a slave to a computer screen or other electronic gadget in order to read them. The chapters are short, perfect for one to read while nursing a baby, taking a quick break with a cup of something nice to drink or even while watching children play outside. Any mother would feel refreshed after just a few paragraphs; Sharon seems to know how to blend the simple with the profound." "This is one of the best books I've read!!! I am so glad I bought it. I have read a few pages each day and just finished. However, I will be reading it again right away. It has been a huge encouragement to me, especially when I don't feel like cleaning or cooking. Each time that happened, I'd sit down and read a page or two, then I would be motivated to continue on. I will be sharing this book with my grown daughters with hopes it will bless them as it has me." "I know that Mrs. White has a love of her husband and children and now grandchildren, however, her greatest simple sweetest love is of the Lord and the Word. I’m not quite sure how to describe it, without taking away from the time she would want you to spend in scripture and prayer – but I think that this would be a perfect resting quiet time book. Almost like a devotional for mothers in the home. Each entry can stand alone, is just a couple of pages long and will bring encouragement. . Without reading her words for yourself, it is hard to describe the voice that comes through, pleasant, calming, real, transparent." "I have to say that I was inspired by Mrs. White's attitude toward work. She has definitely caused me to look at housework in a different way. She didn't share housekeeping tips, recipes, or how-tos, but she shared her sweet attitude toward her family and her work, and that's just what I needed!" 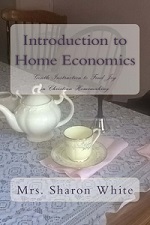 "For the Love of Christian Homemaking" is filled with "visits" with Mrs. White. In her book she shares how she goes about her days, how she serves her family with making a pleasant home for them, how she has battled poverty and illness (Mrs. White is a cancer survivor), how she sometimes fails in her duties, her faith, and so much more. 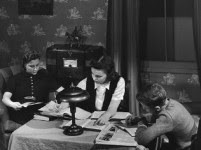 I love that she shares memories and information from times past and how women of old used to do things, and how they took such pride in their work at home. This is truly a great encouragement to me, and I'm sure it will be to you as well." "I loved this book of "musings" of a homemaker. I love this author's blog (Legacy of Home) and really enjoy having a book of her wisdom to keep bedside. As others have said, it encourages the homemaker to GET BUSY making a sweet life for her family, while also creating a life-giving atmosphere that she, herself, can enjoy. Inspiring!" 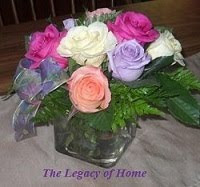 "If you are a fan of Mrs. White from her blog, "The Legacy of Home," then you will love this book. It is filled with her best blog posts. As a Christian homemaker myself, this book is considered a necessity for me. It sits right on top of my Bible. Sometimes I lose my focus as a homemaker, and this wonderful book brings me right back. It doesn't read like a normal book...chapter to chapter. Like I said they are blog posts. Most posts are about one and a half pages so it's wonderful to grab, and read just one post, if you're busy, and get a bit of motivation to keep going. I consider it a must read if you are a Christian homemaker." "This book is the encouragement that homemakers would benefit from in a world that constantly devalues their work as the professionals that they are. Mrs. White has a way with words that not only calm but inspire those who are serious about the responsibilities of homemaking. I loved this book and am reading it through for the second time. Thank you, Mrs. White, for the mentor that you have become to so many!" " I have been a reader of Mrs. White's blog for some time. It's nice to have many of her writings in one place. Such an inspiration to Christian women. 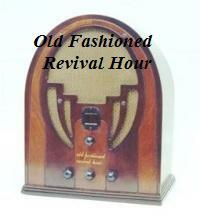 I highly recommend!" "Godly encouragement from a Titus 2 woman. . . This is such a sweet book. I appreciate the encouragement each morning as I read a few pages before I begin my day. Taking care of a family and home can be such a joy and Mrs. White's cheerful attitude and thankful heart shine from each page of the book. I would love to sit down to tea with her sometime!" "Mrs.White writes from the heart.. her books are like taking a peek into her journal.. I am always blessed.. I have read this one 3 times.. so far!" "I loved this book! It truly inspires me to love and want to care for my home. I love and respect Mrs. White’s viewpoints and her way of expressing them." My, you are full of surprises Mrs. White! Thank you for sharing the good news and best wishes for many, many sales. I have no doubt there are quite a few gems in your book and I am looking forward to review it on my blog. Hope you had a blessed and Merry Christmas and are getting well-rested! I am so happy to hear the news of a second book being out! That is really great news!! Congratulations Mrs. White, it is such a pleasure reading your blog. I've been trying to comment about your posts lately but for some reason I cannot. I hope that you can see what I have written. I like your blog so much, I just placed an order for the book. I am looking forward to receiving it! Oh Mrs. White, your book just arrived. Two copies, I ordered one for my sister-in-law. It's your blog, only here! In my hands! I'm having to make myself put it down and go about my afternoon tasks. 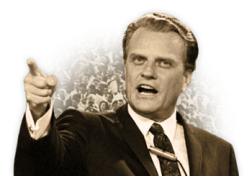 Thank you for obeying God and ministering to us with your gift of encouragement toward leaving a legacy of home.